A quote the author looks at when she studies. This semester in Professor Lisa Mazzie’s Advanced Legal Writing: Writing for Law Practice seminar, students are required to write one blog post on a law- or law school-related topic of their choice. Writing blog posts as a lawyer is a great way to practice writing skills, and to do so in a way that allows the writer a little more freedom to showcase his or her own voice, and—eventually for these students—a great way to maintain visibility as a legal professional. 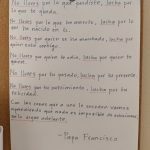 Here is one of those blog posts, this one written by 2L Mariana Concepcion. Last summer after finishing my 1L year, I was at the beach. While I was enjoying the warm Texas sun, my brother asked me, “So, what’s your goal in law school?” Because it was a few days after taking my last final, I thought about answering “I don’t ever want to go back.” But I didn’t say that, I was just really tired. I gave the question some thought as I looked out at the sea. What was my goal in law school? Why was I going back? So, I told my brother that my goal was to find my own voice so that I could use it to help those who don’t have a voice.